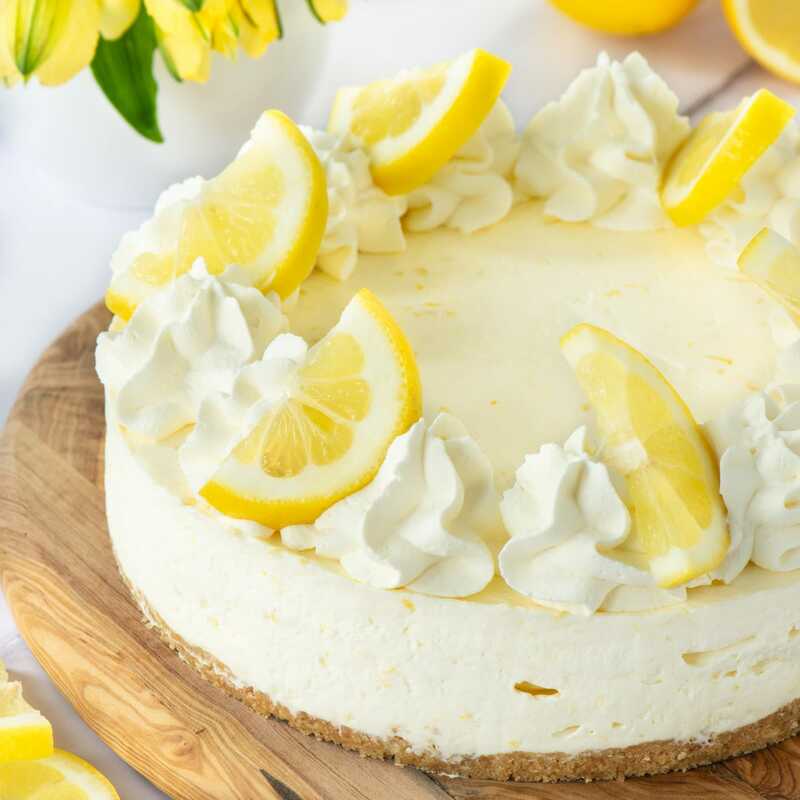 Easy No-Bake Lemon Cheesecake – A delicious lemon cheesecake with a crunchy biscuit base that’s absolutely packed full of flavour from the fresh lemon zest and juice. It’s unbelievably moreish! Introducing one of the most moreish desserts I’ve ever made – No-Bake Lemon Cheesecake. This lemon cheesecake is a dessert I hadn’t really expected to share on here. 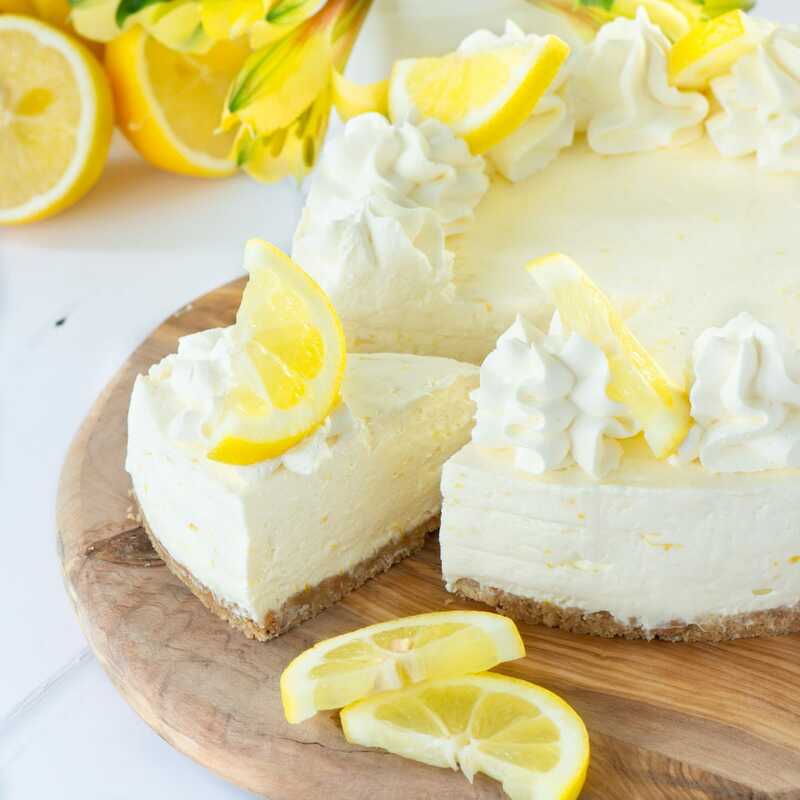 The simple reason is that until recently, I didn’t think I was particularly fussed on either cheesecakes or lemon desserts (so I really wouldn’t go for something that combined the two). This stems back to the fact that I wasn’t keen on them as a child, and like a stubborn child I flatly refused to give them another go until recently. You may have guessed by the regular stream of both lemon desserts and cheesecakes appearing on here in recent months, I’ve completely changed my mind. I realised that as my tastes had changed when it came to so many other foods, they had probably done so with both lemons and cheesecakes too, and I’m so glad I decided to give them another go. I have to say that this lemon cheesecake is one of the most moreish desserts I’ve ever eaten. It’s quite light, while still being packed full of flavour, so I could keep eating it for ages. In the end, I had to pop the rest of the leftover cheesecake into the freezer to stop me polishing it all off! 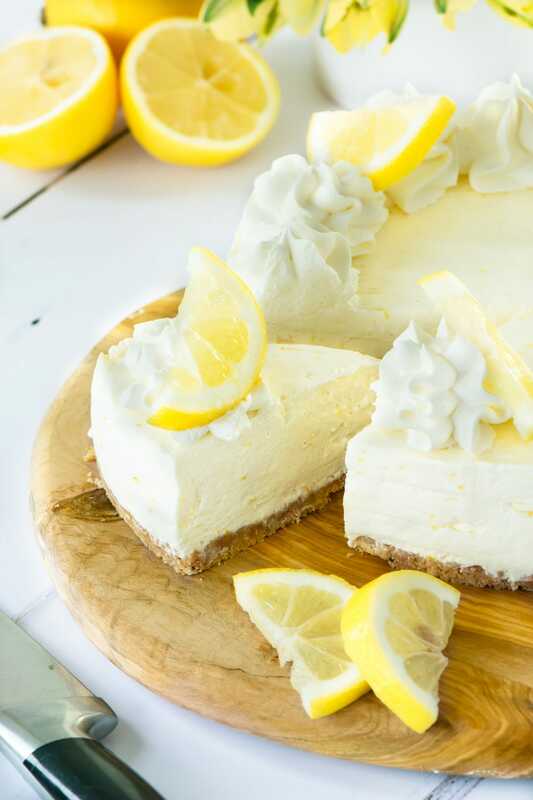 Easy No-Bake Lemon Cheesecake - A delicious lemon cheesecake with a crunchy biscuit base that's absolutely packed full of flavour from the fresh lemon zest and juice. It's unbelievably moreish! Line the base of an 18cm round loose bottomed tin with greaseproof paper or a reusable baking liner. Crush the digestive biscuits (100g). Put the biscuit mix into the prepared tin and use the back of a spoon to push it flat. Put the tin into the fridge to chill while you make the topping. Finely grate the zest of 2½ lemons. Squeeze out the juice until you have enough for 5 tsp and set aside. Whip the double cream (280ml/300g) until it forms a soft peak. Add the cream cheese (250g), caster sugar (100g), lemon zest and lemon juice. Whisk together until combined and thick. Remove the tin from the fridge and add the lemon mixture. Add a little at a time and push the mixture down with the back of a spoon, so there are no gaps. Once you've added all of your lemon mixture, smooth the top with a palette knife. Put your cheesecake into the fridge for at least 2 hours to set fully. When you're ready to serve, carefully remove the cheesecake from the tin. You may find the edges become a little smudged as you do this. If this happens, simply run a small palette knife around the edge of the cheesecake to smooth it out again. Whip the double cream (75ml/80g) until it forms stiff peaks. Put it into a piping bag fitted with a star nozzle (I use a JEM1B) and pipe 8 small swirls of cream around the edge of the cheesecake. Top each swirl with a half slice of lemon. This cheesecake freezes brilliantly. 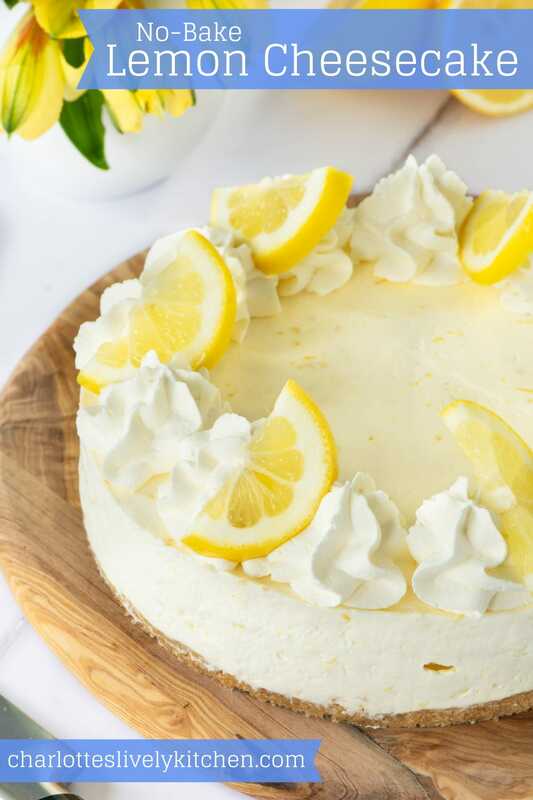 However, I would recommend adding both the fresh cream and lemon slices to the top just before serving as the cream will go grainy if it’s frozen and then defrosted. Keep it in the tin (if the tin is freezer-safe) – cover the top with clingfilm to protect it. Wrap it in clingfilm – pop it into the freezer for a couple of hours on a freezer-safe plate (either uncovered or loosely covered with clingfilm. Once it is firm, you can remove it from the plate and wrap it with clingfilm. It’ll hold its shape well despite not being in a container (as long as you don’t pack it in too tightly!). When you remove it from the freezer, take off the clingfilm immediately (otherwise it will stick to the cheesecake mixture). If you find there are some clingfilm marks on the surface of your cheesecake, simply run a palette knife around the edge to smooth it. For all of these options, make sure you put the cheesecake onto your serving dish when you take it out of the freezer as it’s much harder to move once it has defrosted. 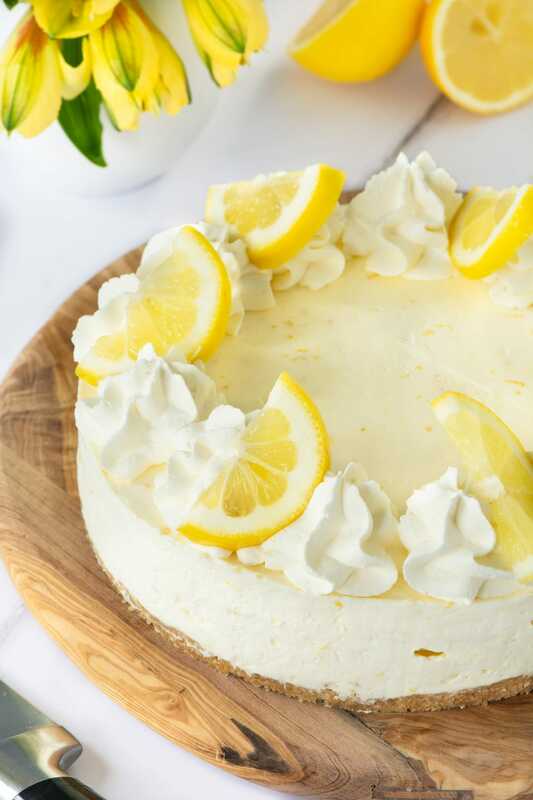 This lemon cheesecake can be made gluten-free by switching the digestive biscuits for a gluten-free alternative.